You just rented a new office space but might be having a difficult time decorating. You feel excited, yet overwhelmed about sitting and staring out at the beautiful view of your new office window, but office organization doesn’t have to be stressful. Each person’s relationship to their workspace is different. Here are three things you can focus on to ensure that even something as mundane as your slab of wood on stilts can contribute to your creativity and productivity in your workspace. The simple concept of desk placement can have the greatest impact on productivity. The desk is the focal point in any office, and determining the available floor space allows you to create a functional room layout around that focal point. 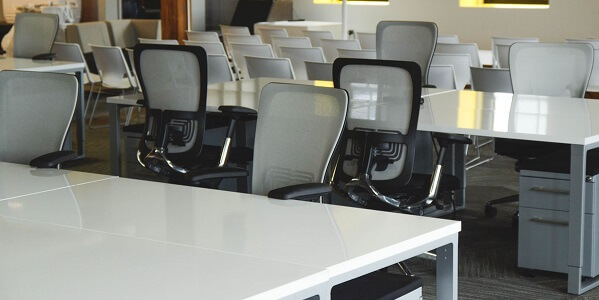 Desks can be scattered with an open-concept room, lined up side-by-side, or arranged in groups, depending on personal preferences and goals of the company. Capture wasted space by making the corner of a room the center of the work area. A corner often ends up as a black hole for lost papers and supplies. Instead, make this command central. Desk space layout provides crucial groundwork for the next two steps of workspace decoration: furniture and wall décor. Without a well-though-out desk placement, you may feel too cramped or too exposed to focus on what needs to be done, hindering productivity. Two words: mobile furniture. A mobile desk allows you to work where ever you want. Furniture and placement go hand in hand when trying to maximize your desk space. Set a desk and chair in front of a window, and fill an empty corner with a tall bookcase. Tomorrow, wheel the desk to the corner. A few accessories (desk, chair, floating shelves) can transform a cozy space into an effective workplace. When renting limited space, make the most of it by maximizing flexibility. Every office needs areas conducive to organization and creativity. Think vertically so you don’t spread out too wide and become disorganized, and take advantage of wall space. Use vertical shelving units and boards for storage and notetaking. Vertical wall files easily attach to a wall and help keep work projects, mail, and other papers from cluttering your work area. Cork and magnetic boards provide a spot to pin notes and important papers for easy access. You can even hang a white board to quickly jot down important reminders. So, if you’re under the impression that you need a huge, expensive room to set up a workspace, that’s no longer the case. Brilliant, work-friendly spaces can emerge from a cost-effective, small space, a spare corner, or a few inches of a wall. Contact Sky Interests for more information at 972-771-7577 or via email to mail@skyrei.com.